The significance of auditory function and the developmental costs of teaching signing or "Total Communication"
In order to determine appropriate treatment approaches for children with Down Syndrome (DS), one must first, look at "normal" development, and then explore how and why the DS population differs. When considering language acquisition we encounter historic problems that are not dissimilar from those of any of our special needs populations. The primary problem is the overwhelming tendency among educators, therapists, and caregivers to treat symptoms, when what is needed is a neurodevelopmental approach. A neurodevelomental approach involves identifying the developmental and neurological factors involved in each area where "symptoms" imply delayed or inappropriate function, and then determining how we can intervene and make a significant impact on the issues that created the problem in the first place. In this discussion we should first make a distinction for parents between speech and language. These terms are often used interchangeably, but they need to be separated if we are to understand the components involved in helping an individual to verbally articulate his or her thoughts explicitly with good enunciation. Important lines of distinction tend to get blurred in this discussion, because of issues pertaining to word articulation. To be "articulate" generally means to be able to speak effectively, which would place the word squarely on the language side of the ledger. But, we use the word "articulation" to refer to the ability to enunciate, to pronounce a sound, a phoneme, a word or a sentence clearly. Obviously this is an issue of speech, not language. We want our child to speak with good articulation and to be articulate; that is, we want both good speech and language. For our purposes let us define speech, as the neuro-motor function of pronouncing words clearly. Language we will define as the neurodevelopmental ability to use words, and to combine words so as to communicate. DS children historically have both speech and language problems. We will first look at language—because you must first have words you want to say before we can be concerned about how well you pronounce them! One quick insight into what language is and where it comes from is to look at the difference in language function between a child who hears normally, a partially deaf child, and a totally deaf child. A normal child develops normal language, a child with some hearing may develop language, but if so it tends to be delayed and limited as a reflection of the degree of hearing loss, and the deaf child does not develop vocal language unless significantly alternative means are employed. From this one can infer an observation that has been demonstrated again and again—the basis of language function is auditory function. We must first have good hearing and processing of sound. Therefore, our first concern in the acquisition of language in DS children is auditory function and hearing. Following our neurodevelopmental model, we will look at the "normal" development of auditory function and see what about DS is different and adversely effects that development. To understand the significance of hearing it is important to note that the auditory nerve, which is the 8th Cranial nerve, is the most primitive nerve in the body; the first nerve to develop in the fetus. This nerve and the stimulation of this nerve are very critical to the entire development of the child. The brain begins to learn how to process sounds in utero. The child is not born with the ability to process a full range of tones well, as a matter of fact, many people never learn to process a full range of tones well. The human ear can process tones throughout a huge range, from 20 Hz. to 20,000 Hz. The brain must learn how to process these tones, particularly the tones that are within the language range. One can develop an understanding of tonal processing by looking at the ability to hear and articulate a foreign language. The child generally learns how to process the tones in their native language during their first two years of life; some tones are unique to specific languages and absent in others. If the child has not learned to hear those tones the child will not be able to articulate those tones, and if enough of those tones are missing, the language, which they are processing, is extremely garbled. An example of a missing tone is the inability or difficulty of Japanese speakers to hear or pronounce "R" sounds. To speak a language you must be able to hear the specific tones in that language. Do children with DS have a more difficult time learning to hear tones, and if so why? 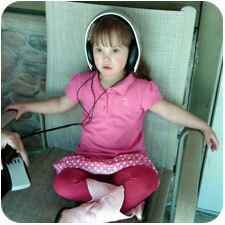 Many children with DS do have a difficult time learning to process tones. If the quality of the brain's auditory input is disrupted or interfered with, auditory tonal processing development will be delayed or permanently impaired, unless there is specific and effective therapeutic intervention. Generally, if language is delayed or if there is some question about a child's hearing, hearing tests will be conducted. These tests are either subjective or objective. Subjective tests include the audiogram in which the child is asked to respond in some manner to tones. Objective tests include the auditory evoked response test, which measures the brain's response to specific tones. These tests can generally be relied upon to identify significant global hearing loss, but they do not attempt to test more than a few sound frequencies. Many tonal processing deficits escape detection. For example, the inability of a native Japanese speaker to hear an "R" will not show up in such testing. In these tests, typically about 8 frequencies are tested across the 20,000 frequencies that we should be able to hear. This is a very partial measure of auditory tonal processing. Auditory tonal processing problems are very common. Physical problems that adversely effect auditory tonal processing are not unusual; unfortunately, with our DS children, they are more the norm than the exception. Fluid or pressure in the middle ear is one of the most common problems affecting the development of auditory tonal processing. In our DS children this problem is almost universal. DS children tend to have narrow Eustachian tubes. DS children also tend to have low muscle tone. Coupled together, this makes it very difficult for the middle ear to drain. This problem is compounded by factors associated with a weak immune system, sinus congestion and mouth breathing. A cursory look into the child's ears is not going to identify these problems. I strongly encourage the parents of every DS child under the age of five years to work closely with an ENT (a physician specializing in treating the Ears, Nose and Throat). Very regular visits to the ENT, including a tympanogram test for fluid or pressure problems in the middle ear, along with checks on the status of the tonsils, adenoids, and sinuses are essential for all DS children. Our DS children are predisposed to having problems which adversely affect the structure and thus the function of the ears, throat, sinuses, and oral cavity. These problems adversely affect the quality of auditory input that the brain receives and significantly impact the development of auditory tonal processing. If our children are not developing normal auditory tonal processing they will be unable to hear tones well and are unable to process language well, thus creating a problem with the development of language. Parents of "normal" children often observe a problem in the child's language development when their son or daughter has a middle ear fluid problem or an ear infection. When these problems occur it is commonplace to see regression in language function. Remediation of tonal processing problems has been one of my emphases for over twenty years. When I first recognized the problem, I couldn't find an effective treatment; I couldn't even find anyone else who understood the problem! In the seventies I was doing some work in Spain and heard of the work of a French ENT, Dr. Alfred Tomatis. Dr. Tomatis trained professionals and treated patients using special equipment he had designed to improve hearing. I flew to Madrid and met with a physician trained by Tomatis and was impressed with the results they were achieving. Upon returning to the States I began referring some of my children to Paris to work directly with Dr. Tomatis. In the past twenty years there have been many developments in the area of auditory training, all of which are based on this original work by Dr. Tomatis. NACD has utilized (and in most cases NACD staff has been directly trained in) every major auditory training approach, always in an attempt to find better technology and methodology. Even the best of these programs have entailed accepting some trade-offs in terms of their expense, convenience, and/or efficiency. The best and most recent development is a home-based treatment program developed by Applied Brain Technologies, which is based on input from NACD. This collaborative program is not only based on our experience but also that of leaders in Tomatis's work and the field of psychoacoustics. Professional training in ABT's "Listening Program" is presently being conducted in Europe and the United States. Early research results on this new program indicate that we now have a safe, powerful tool that is easy to implement in the home and which significantly improves auditory tonal processing. The first step in providing a strong foundation for speech and language is to develop good auditory tonal processing. The second step in providing a strong foundation for speech and language is establishing adequate auditory sequential processing. Auditory sequential processing is the ability to take in bits or pieces of auditory input and to process these pieces in a sequence. Initially, each individual phoneme is a bit, then we learn to recognize a group of phonemes together (a familiar word). Eventually a familiar couplet or phrase is also recognized and processed as a single bit of information. As the child develops the ability to sequence more and more bits, her language ability grows. This language progression grows from an initial sound, to an approximation, to a word, to a couplet, to a three-word phrase, to a four-word phrase, to a sentence and then strings of sentences. The function that makes this possible is auditory sequential processing. Normal auditory sequential development occurs at the rate of one bit per year of development. Thus a one-year-old child can process one piece, a two-year-old two pieces and so on. Normal auditory sequential processing for a child of seven years or older is considered to be seven plus or minus two digits. Our perception is that anyone over the age of seven with a digit span of less than seven has a deficiency in auditory sequential processing. Auditory sequential processing determines the ability to process language, to think conceptually, and to express oneself in words. The quality and quantity of specific auditory input, which the child receives, determines the development of auditory sequential processing. What constitutes quality auditory input? Quality auditory input is sound in the form of clear tones and words that are presently in an acoustically friendly environment and which match or slightly exceed the auditory processing skills of the listener. What this means is that we need the child to be in an environment as free of extraneous auditory input as possible, void of noise if you will, and which is organized with an understanding of the processing skills of the listener. Extraneous auditory input noise is any sound that isn't needed. I once heard a successful old farmer define a weed as "any plant growing in the wrong place." For our purposes, noise is any sound that appears in the wrong place and time, usually because it is extraneous to the function being performed. Auditory input that fits the listener is input that matches or slightly exceeds the processing of the listener. If we are cognizant of the auditory sequential processing skills of the child, we can speak to the child in pieces that the child can process and stretch them one step further so that we are both communicating and helping to move the sequential processing one step further. The optimal environment for this quality auditory input is a quiet room with one child and one adult. The further we get from this model the further we get from providing the child with optimal auditory input. The more extraneous sound, the more noise, the more voices, the poorer the quality of input. The child's problems with auditory tonal processing further reduce the quality of input. If we address the child without awareness of the child's sequential processing capacities, the input will be of even poorer quality. Anything that diminishes the quality, quantity, or intensity of appropriate auditory input that the child receives needs to be perceived as diminishing the opportunities for the development of language. Having evaluated accelerated and remediated auditory sequential processing in some 20,000 children and adults, we understand the significance of auditory sequential processing, not just in the development of language, but in the development of cognitive function and learning. There is a direct correlation between language development, cognitive development, academic development and auditory sequential processing. Language development is based upon five major factors; the physical health of the child, the opportunity to develop good auditory tonal processing, the opportunity to develop good auditory sequential processing, the opportunity to receive as much quality auditory input as possible, and the child's need to speak to be understood. Before we move onto problems associated with speech, I would be remiss if I did not offer some discussion as to the child's need to speak. When we evaluate a child's lack of language function, we evaluate the health, the tonal processing, the sequential processing, the environmental opportunities for quality input and the child's need to speak. This last factor can have a very major impact on the development of vocal language. Working with a full range of children has many advantages, one of which is it makes it possible to identify problems that on the surface have different origins, but which on closer examination are in fact the same. In our work with accelerating development in "normal" children, it is not unusual to find a situation where we have a very motivated attentive mom who is very attentive to her only child. In many of these situations, the child's language skills are superior as a reflection of the excellent opportunities the child has received, but there are some exceptions. The exceptions are children whose moms know what they want before the children do or whose grunts are interpreted with almost psychic clarity. These children have no need to speak, no need to work at learning the "foreign language" that their mothers use. As with most of us they take the easy road. In our DS population we often have exactly the same experience we have with our "normal" children, and sometimes it has a twist. The twist is the use of an alternative means of communication. Providing most children with an alternative means of communication can eliminate the need to speak, or the frustration that would be experienced at being unable to communicate. This will generally delay the development of language. Neuro-motor problems involving speech are unfortunately very common among DS children. The origins of these problems are the same as those in the development of auditory tonal processing and sometimes are the reflection of auditory tonal processing or sequential processing problems. Health issues that effect the development of the sinuses, mouth, and tongue are the culprits in the development of the structures required for good articulation. The typical scenario involves chronic problems that can originate with the ears, throat, tonsils, adenoids, lungs or sinuses. Low tone coupled with chronic problems that lead to mouth breathing, poor chewing, poor tongue control and tongue thickening, inadequate sinus development, high palates, enlarged tonsils and poor lung capacity all create structural problems that impair speech. These problems can be lumped together as oral motor problems. In order to develop good speech, general health and oral motor issues must be addressed. There are many oral motor techniques and methodologies which can be employed, and which should be included in the therapy program for these children. Some speech problems are reflections of auditory tonal issues rather than (or in addition to) neuro-motor problems. If the child is unable to hear a tone properly he will be unable to reproduce that tone properly. One of the more common signs of auditory tonal processing problems that should be noted are problems involving hypersensitivity or hyper-acute hearing. These problems are universally a reflection of an auditory tonal processing problem and one can infer that in addition to the obvious hyper frequencies, there are also other tones which are being underrepresented (or hypo). No amount of oral motor work is going to correct a speech problem that originates with an auditory tonal processing problem. Auditory sequential processing also has a significant effect on speech. Children will generally try to use more pieces that they can hold onto and will produce what I call tonal approximations of the language. You can liken this to humming the tune to a song for which you have forgotten the words. If a child, for example, has the ability to auditorially sequence two pieces, the child may come out with what is almost a four or five word phrase which consists of many of the vowel sounds and very few if any consonants. If you already know what the child is talking about you may be able to figure out what they are saying. We refer to this process as "chunking," which means that rather than isolating the pieces and articulating each phoneme, the child is putting the whole phrase together as one chunk of information. If a child is able to reproduce individual sounds and articulate one or two syllable words well, but the articulation breaks down if the child tries to say a longer phrase or sentence, the problem is the auditory sequential processing. Speech problems may be a reflection of neuro-motor issues, auditory tonal processing or auditory sequential processing problems. Comprehensive intervention must address the specific problems that adversely affect the specific child. 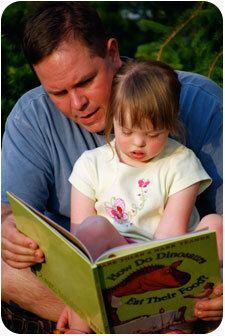 A significant controversy exists today as to whether children with DS should be taught to sign. I have watched the development of this trend with anxiety. Resorting to sign language is a reflection of symptomatic intervention. This trend is a reflection of understandable frustration and a lack of understanding of the components of speech and language and how to successfully remediate such language acquisition problems. Signing and total communication approaches are rarely the best option for DS individuals. Most children with DS who have speech and language problems are not receiving the necessary healthcare intervention they need to facilitate good oral structure and function. Most are not receiving good oral motor intervention, most are not having their auditory tonal or sequential processing issues addressed; therefore, most are in trouble. Teaching sign language is a very understandable impulse. If I were responsible for helping a DS child learn to communicate and I did not understand the developmental components involved in speech and language or the intervention that is necessary for language to develop, I might resort to signing as well. It seems harmless enough. It can help relieve the child's frustration at not being able to communicate. It is done with the best of intentions. At least it should not hurt anyone. I understand the logic. Many children never even obtain communication at all. Signing is better than nothing. After all, once there is communication, we do gain new levels of access to the uniqueness and beauty of the child. But my experience has been that it almost universally does hurt. Part of the problem revolves around the perception of potential. Those who have seen very few DS children learn to speak and communicate well are often happy to accept less and are pleased with the results that are achieved. My goal is always to achieve normal function. I often object to traditional physical therapy approaches because they are aimed at achieving any kind of "walking", rather than normal walking. It is ok to forget about developing normal muscle tone, normal muscle balance, or taking the child through the normal developmental steps if the only goal is "walking". But if you want the child to walk "normally", you had better put all of the pieces together properly. The same is true of speech and language. When you take developmental short-cuts, you are cutting your developmental throat. Your short-term solutions can destroy your long-term goals. Signing or Whole Word approaches adversely affect normal development. The primary input that drives the development of auditory tonal and sequential development is the processing of language. Listening to and trying to process speech is the primary input that drives a child's development of auditory tonal and sequential processing. If we establish a means of primarily visual communication, the child will "tune out" spoken language, and lose this very critical input. It is argued that with a Total Communication approach the child is hearing the word as well as seeing the sign. The reality is that all young children are primarily visual learners, not just DS children, and that everyone concentrates on whatever works best. When you simultaneously sign and speak, the visual input far outweighs the auditory. This dramatically reduces the intensity of the auditory input, thus decreasing its effect upon the brain. One future complication involves the development of the articulation. A child who is intently trying to understand what you are saying will closely watch your mouth and will often mimic your actual tongue and lip movements. If a child is watching your hands, they are not watching your mouth. And if they are communicating via signing, they are not so frustrated anymore. But frustration is what drives development. All theory aside, I have worked with many thousands of DS children over many years. The families that I work with come to me having utilized all manners of treatments. I have no vested interest in using or not using signs or any other technique for that matter. We use and recommend thousands of techniques. My interest is only in finding out what works and preferably what works best. My experience has been that those children who use signs, particularly those who go beyond a very few rudimentary ones, are significantly more delayed in their language function than children with similar basic function who do not use signs. I have also seen that some children's auditory tonal processing, auditory sequential processing, speech and language development are irretrievably harmed. But, the primary concern and dialogue should not be directed toward signs or no signs, but toward putting the necessary pieces together so as to accelerate the language development in our DS children and avoid the need for such alternative means of communication. The rate at which a specific child's speech and language develop is determined by a combination of factors. Slow or delayed development does not reflect low potential. However, we must address the specific neuro-motor and neurodevelopmental needs of the child. Otherwise the child will probably not get the opportunity to develop fully and realize his or her potential. We have learned a tremendous amount in the last few years about the development of speech and language. In just the past year, some very significant tools have been created which will have a dramatic impact on our children. Do not compromise. Work hard to provide the children with every possible advantage. "Normal" is not an unrealistic goal.